The Orion 420 Industrial Weather Station offers a complete weather station for industrial PLC interface. With Orion weather stations featuring their ultrasonic technology, the Orion 420 offers high accuracy and stability. Both wind speed and direction are measured using an advance ultrasonic sensor. The sensor uses ultrasound to determine horizontal wind speed and direction. The array of three equally spaced ultrasonic transducers on a horizontal plane is an ideal design which ensures accurate wind measurement from all wind directions, without blind angles or corrupted readings. 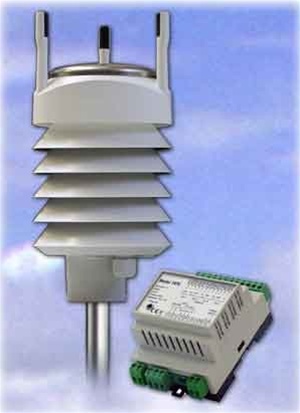 With these Orion weather stations, barometric pressure, temperature, and humidity measurements are combined in an advanced sensor module utilizing capacitive measurement method for each parameter. Humidity measurement is based on a capacitive technology. The sensor is highly accurate and it offers excellent long-term stability in a wide range of environments withnegligible hysteresis. The measurement range for humidity is 0 to 100% RH.